Mayor’s Office of Housing and Community Development Proposal: Of the 331 apartments offered, 285 would be new rental apartments and 46 would be affordable homes. The 46 affordable homes would be located in a building which would be dedicated to the City of San Francisco. These 46 affordable homes would be targeted towards participants of the SRO Family and Moving On voucher programs. Income generated from the 46 affordable homes, estimated at $1.15 million, would provide rent subsidies to an additional 159 Mission District households. In total, this proposal would provide homes and subsidies to 205 Mission District households. Land Dedication: Maximus has entered into agreements to purchase two previously entitled market-rate developments in the Mission District. Instead of building market-rate apartments, Maximus would build and dedicate 192 units of 100% affordable housing to the City or non-profit. 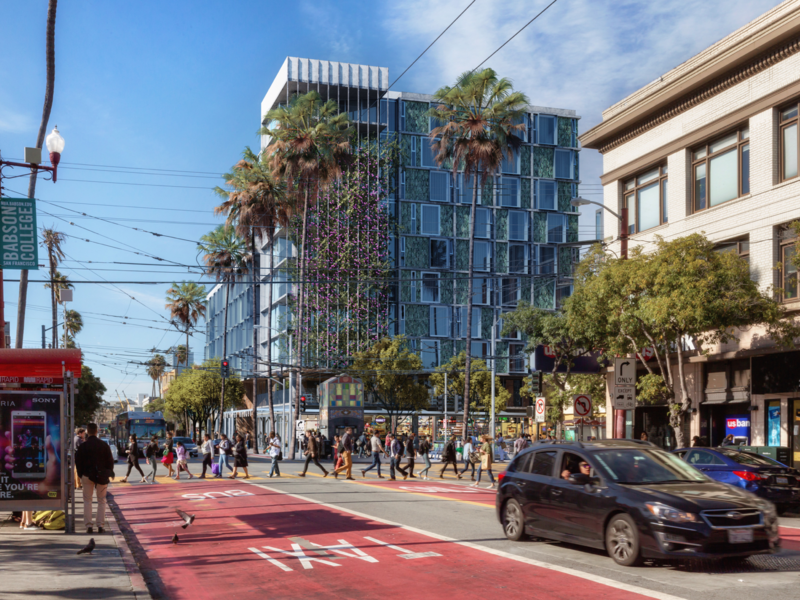 By utilizing the City’s density bonus, the two parcels could yield an additional 114 units of 100% affordable housing, bringing the total of both sites to up to 306 units of 100% affordable housing in the Mission District. 32,500 square feet of retail, including space dedicated for use as a pharmacy and a Mercado with individual vendors and stalls. A portion of the stalls in the Mercado will be made available for free or at deeply subsidized rent for local Mission start-up vendors, artists, and crafters and will further be operated by a local Mission District non-profit. 4 dedicated car share spaces. 22 parking spaces for retail use and 137 parking spaces for residents. An increase in plaza size by nearly 40%, providing a more vibrant, dynamic, and robust plaza for people to gather and engage with the community. Street improvements along the project’s street frontage, in addition to the entirety of the western edge of Capp Street between 16th and 15th Street so that Marshall Elementary School students and family have a safer route to school. 1979 Mission Street will not displace residential homes as no housing exists on the site today. © Copyright 2019 Maximus-BP 1979 Mission Street LLC. All rights reserved.